Episode #53 Patrick Byrne Speaks! On today’s show I am honored to be speaking with a modern day American patriot, Mr. Patrick Byrne – the CEO of overstock.com. Patrick teaches us about public education in the United States and how it is sadly broken on many levels - with more money often going to administration than to our teachers and our students. Patrick also tells us the truth about the SEC. He talks to us about mobsters on Wall Street and the crooked games they’ve all but perfected to rob this country blind. And of course he tells us about his project to create the stock market of the future – one devoid of the criminal elements. Coming soon you’ll be able to find full transcripts of each episode of Bitcoins and Gravy in the Transcript section of BitcoinsAndGravy.com. Professional transcription provided by one of our fans who can be found at: http://diaryofafreelancetranscriptionist.com/ Magic Word Hidden in each episode of Bitcoins and Gravy is a Magic Word. I know that it may sound absurd, but listen for the Magic Word and you can earn LTBcoin! First set up a free account at LetsTalkBitcoin.com. Then tune in to your favorite LTB podcast and when you hear the Magic Word, don’t delay! Submit it to your account and by doing so you will earn a portion of the week’s LTBcoin distribution. Setting up an LTB account has always been fast and easy . . . but now it’s profitable!!! CREDITS & RESOURCES Overstock.com press releases can be found here: http://www.overstock.com/84821/static.html?TID=FOOT:CI:MEDIAROOM Here are a few links specific to Bitcoin: http://investors.overstock.com/phoenix.zhtml?c=131091&p=irol-newsArticle&ID=1889670 http://investors.overstock.com/phoenix.zhtml?c=131091&p=irol-newsArticle&ID=1966205 http://investors.overstock.com/phoenix.zhtml?c=131091&p=irol-newsArticle&ID=1969031 Deep Capture: https://www.deepcapture.com/ Medici: http://www.wired.com/2014/10/overstock-com-assembles-coders-build-bitcoin-like-stock-market/ Profile on Patrick in WIRED: http://www.wired.com/2014/02/rise-fall-rise-patrick-byrne/ CREDITS: Bitcoin Blues Lyrics and Music by John Barrett 2014, RJM Publishing [BMI] Bitcoin Blues was Recorded live at the Laarzen Huis, Amsterdam, Kingdom of the Netherlands January 11, 2014. Many thanks to Jan and Marielle for the excellent voedsel! ; ) Special thanks to Alex Munõz Guijarro for his excellent pedal steel playing on many of our shows. Interviews for this episode were recorded and edited by John Barrett at The Tree House Studio - East Nashville, Tennessee. All shows are produced by John Barrett with the moral support of his trusty sidekick Maxwell Rascalnikov CoyoTe Rex, aka Max. Theme song “Gravy” by the band, Eleanor Roosevelt with Elijah “Lij” Shaw on fiddle. And a big thank you for moral support from my good friends at The Tennessee Bitcoin Alliance: TennesseeBitcoin.org Questions or Comments? 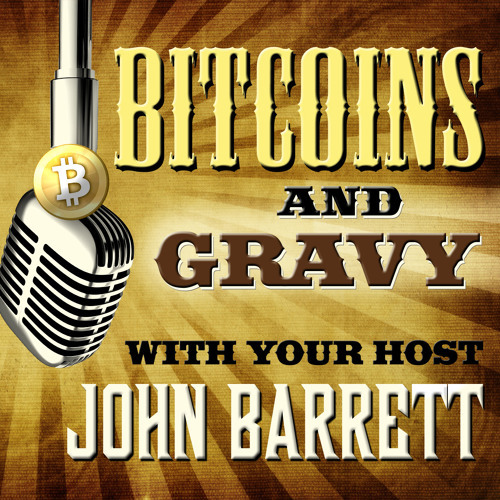 Bitcoins and Gravy Hotline: (615) 208-5198 Listeners . . . listen up! Call this number and say something funny, sing a song, read a poem or just rant! Or if you’d rather you can ask me a question, leave a comment, make a suggestion or record a complaint! If I like what you say I’ll put it on the next show! Email me to say Howdy! : howdy@bitcoinsandgravy.com Visit theWebsite: BitcoinsAndGravy.com Bitcoins and Gravy Tipping Addresses: Bitcoin: 1ByqQXLTm9JZGSwnfqCCakaifBt3grQkXS Litecoin: LgqYgxLTBPgr8C1JGLLJVLK4ZN1fveprAp LTBcoin: 18iGEi3ou4523M6eECAf1rWygaSBXBRR63 And if you don’t feel like contacting me, just kick back, relax and enjoy the show. I hope you enjoy listening to my guests as much as I enjoy talking with them! Download Episode #53 Patrick Byrne Speaks! Users who like Episode #53 Patrick Byrne Speaks! Users who reposted Episode #53 Patrick Byrne Speaks! Playlists containing Episode #53 Patrick Byrne Speaks! More tracks like Episode #53 Patrick Byrne Speaks!